Get Ready For Herdsmen In S’East, S’South, IPOB Alerts Govs. 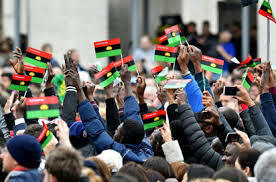 The Indigenous People of Biafra (IPOB) has hailed the recently released US State Department report indicting the Federal Government and security agencies over alleged killings of pro-Biafra agitators as a welcome development. While expressing its displeasure over the caliber of sources cited by the report and the omission of casualty figures, the separatist organization in setting the record straight claimed Nigerian security agents had killed a total of 1, 247 of its members since 2016. The 2017 Country Report on Human Rights Practices released by the U.S. State Department on April 20 indicts the Federal Government for its failure to decisively investigate, curb and punish perpetrators of reported widespread human rights abuse and impunity in the country. The report, particularly, spotlighting extra-judicial killings perpetrated by Nigerian security apparatus––especially the Nigerian Army––specifically mentioned the Shiite and IPOB as victims of such impunity and abuse.